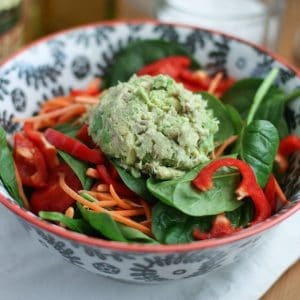 Perfect for a quick and light lunch or dinner, this protein packed Avocado Tuna Spinach Salad will get you back into warm weather clothes comfortably in no time. In a small bowl combine tuna, avocado and lemon juice by mashing together with a fork. Season with salt and pepper. In 2 salad bowls add spinach leaves, carrots, sliced peppers and sliced almonds. Divide avocado-tuna mixture into both salads. Dress your salads to your liking with olive oil and balsamic vinegar. Go easy on the olive oil to save calories!